Clarity, Consistency, and Cohesion are the three core ideas I focus on when designing a game. Lately I've noticed that some games have decided it's a good idea to introduce mechanics that take complete control away from the player. This isn't talking about quick time events or cutscenes. This is about preventing input from the player while gameplay continues around them. There are very few circumstances where removing control from the player is a good idea. Anticipation and feedback are the biggest things I consider when talking about combat systems. 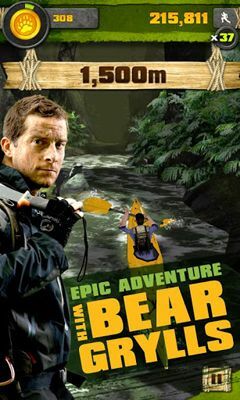 Last week, Survival Run with Bear Grylls was released on the Windows Phone marketplace. While we're all extremely happy to finally bring the game to new players on a different platform, it took a lot of work to get it into a releasable state. This post serves as a brain dump for what we did in order to get the game onto the marketplace. If you haven't heard of it, Super Crate Box is a brilliant freeware game made by Vlambeer, the same guys who brought you Radical Fishing and more recently, Serious Sam: The Random Encounters. SCB could be quickly summed up as Mario Bros plus guns, but it's so much more than that. The game is incredibly fast-paced and can be extremely frustrating when playing with a keyboard- but I don't want to talk about how many keys I've lost or screens I've broken.